Since I last wrote here, at the start of August, New Horizons has already traveled another 100 million kilometers from the Sun, putting us more than 7.5 Astronomical Units out, roughly halfway between Jupiter and Saturn. By the middle of next year, we’ll be beyond Saturn’s orbit, where Cassini is. That will make New Horizons the farthest spacecraft on its way to or at its target. 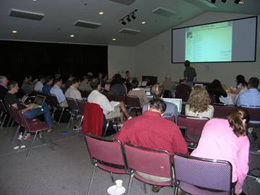 The New Horizons science team hears from Project Scientist Hal Weaver during its September 2007 meeting at Lowell Observatory. Completing the planning for the first of the mission’s annual spacecraft checkouts (ACO-1). These ACOs are our opportunity each year to test spacecraft systems, calibrate instruments, take cruise science data, and make course corrections, as necessary. Suffering a spacecraft prime Command and Data Handling (C&DH) computer reset on Aug. 4. Our mission ops team learned of this event by receiving a “red 2” beacon tone from the spacecraft, which triggered them into an intense three days of activity to diagnose the problem, recover the spacecraft, and return it to hibernation after determining that the reset posed no immediate danger to the mission. Taking precautions based on two shutdowns of our SWAP solar wind instrument during the Jupiter magnetotail exploration earlier this year. These precautions center on keeping SWAP turned off in our first annual checkout while a ground replica is built and tested to ensure we go forward with SWAP operations in ACO-2 and thereafter understanding what caused these shutdowns and how to avoid them in the future. Initiating ACO-1 on Aug. 16. It will continue until Nov. 16. Conducting our first trajectory correction since March 2006 — not long after launch. This 15-minute, 5-mile per hour tweak to our course occurred at 1900 UT on Sept. 27 and it went without a hitch. Our trajectory is now so close to perfect that we don’t expect to have to do another course correction for three to six years! Beginning a series of instrument annual checkouts, instrument calibrations, a few final instrument commissioning (i.e., first-time checkout) activities, and cruise science. 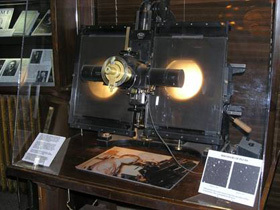 Cruise science occurring in ACO-1 includes PEPSSI measurements of the energetic particle environment between Jupiter and Saturn; imaging by Ralph and LORRI to obtain phase-curve information about Uranus, Neptune and Pluto that cannot be obtained from Earth; and, of course, interplanetary dust environment measurements by the Venetia Burney Student Dust Counter. Conducting a science team meeting in early September at Lowell Observatory in Flagstaff, Arizona, where Pluto was discovered. Appointing mission co-investigator Dr. Cathy Olkin of Southwest Research Institute to succeed Dr. Fran Bagenal as our science team Education and Public Outreach lead. Continuing to build our second ground system spacecraft simulator (“NHOPS 2”), which will be operational after a thorough series of tests by May 2008. Putting in place an ambitious plan to architect, design, and then code our detailed Pluto system encounter sequence in 2008 with a first rehearsal in 2009. And, making a series of decisions on what onboard flight software modifications are needed for the Pluto encounter, based on our bank of real-world encounter experience gained at Jupiter. We’ve identified about a dozen necessary software upgrades in either our C&DH or Guidance and Control (G&C) flight software. These will be uplinked to the spacecraft in late 2008 during ACO-2. So, as you can see, although New Horizons is sleeping much of the time, its ground team is not! In fact, the pace of activity is intense and will remain so until we complete our first encounter rehearsal on the spacecraft in 2009. In the next month, major activities will include more than 50 instrument and spacecraft checkouts, an update to our onboard fault detection and correction (autonomy) software code, the kickoff of Pluto far encounter planning, and the start of software design for the new C&DH and G&C software loads previously described. 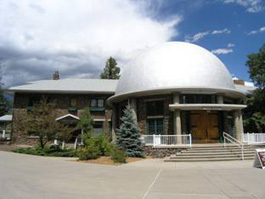 Lowell Observatory’s main building and rotunda, where Lowell himself, his assistant and subsequent observatory director Vesto Slipher, and later Clyde Tombaugh each worked. Keep an eye out for a Jupiter results press conference from the American Astronomical Society’s Division of Planetary Sciences meeting on Oct. 9, followed by a special issue of Science magazine that week with a series of technical reports (and the cover itself) about the significant findings already gleaned from our Jupiter encounter results. Well, that catches you up with where New Horizons is and what the spacecraft and project teams have been doing. I’ll be back with more news in November, as we transition back to hibernation. In the meantime, keep on exploring, just as we do! The blink microscope at Lowell Observatory that Clyde Tombaugh used to discover Pluto in 1930.